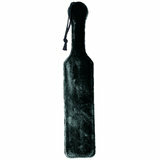 Deluxe leather spanking paddle with cut-out logo that leaves a 'Love' shaped indent on your loved one! Flexible enough to give a re-assuringly firm 'thwack'! Made of two split layers of top-quality leather and stitching. Steel ring and wrist strap mean you can carry or hang it anywhere. 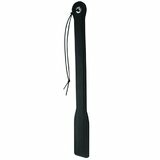 Please note: These paddles are made up of two separate pieces of leather which are not sewn together at one end. This is what gives it the fun spanking sound!